From box CP/CENT/CULT/05. File 08: Printed bulletin, 1975. 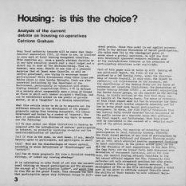 CP/CENT/CULT/05/08: Copy of the group's printed bulletin, Autumn 1975.